Cast: Josh Brolin, Tommy Lee Jones, Javier Bardem, Kelly Macdonald, Woody Harrelson. Written and directed by Joel and Ethan Coen, adapted from the book by Cormac McCarthy. Story: Man finds stash of money, gets chased. Here we go, the first of 2008's Best Picture Oscar contenders. No Country For Old Men is a well-crafted movie, but I can't say it's for everyone. You know the Coens, right? They wrote and directed Fargo, The Big Lebowski and, most recently, The Ladykillers and have a reputation for quirky quality. 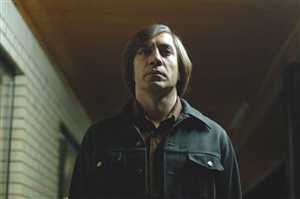 With No Country For Old Men, their reputation is upheld, but it sure is confusing at times. It's the kind of movie that deliberately obscures details and makes you figure them out for yourself - great when it works, bewildering when it doesn't. If you sit and think about it while the movie's playing, you'll miss critical details, so it's best just to accept it when there's reference to a missing floor in an office that has absolutely no significance. There's a lot of that kind of stuff. Story-wise, No Country is pretty straightforward - Josh Brolin, cannier than he looks, finds a stash of money among some dead Mexicans and does a runner with it. Javier Bardem, a kind of human Terminator, comes after him - and that's it, really. The joy is in the little scenes, the passing exchanges between characters and the minimalist acting that we've seen before in the Coens' extras. As far as performances go, No Country is a doozy. Javier Bardem is a shoe-in for Best Supporting Actor and Tommy Lee Jones is particularly watchable - though curiously he was nominated for In the Valley of Elah instead of this. Personally I had some trouble with the very strong southern accents - whole sentences went in one ear and out the other without the burden of comprehension - but the way the movie's shot and acted, it's a pleasure to watch even if you've no idea what's going on. I'm having trouble predicting the Best Picture winner this year, but No Country For Old Men has to be one of the front runners. It's slow and deliberate and so is not for the impatient, but if you like your movies dark and dense, and don't mind a bundle of unexplained plot details, you'll get a lot out of it. To enjoy this film you should be: into awardy movies. No Country For Old Men was released in the UK on 18th January 2008. In today's world of instant gratification, movies take price of place. Few directors are prepared to take the gamble that their audience will "go with the flow" and allow them to take liberties. For instance, are we conditioned to ignore the screen until the opening music has finished? If so, you'd have missed this movie - there's no music of that type at all! For those of course who "understand" the Coen Brothers, this is a delight. Mind you, with the scenery available to them, how difficult could it be to prouce good cinematography... but the lighting, effects and sheer menace that they create is superb. You'll never find a "baddie" as "bad" as Bardem and I loved Woody Harrelson's well acted small role too. 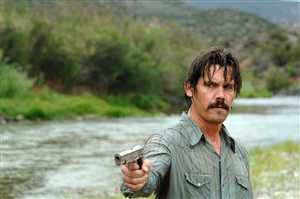 Josh Brolin performs well too - a chip off the old block to be sure, but probably a better actor than his old man!